This will show you how you can perform insert, update, delete operation in an mvc application using entity framework by linq using C#.net. This is called CRUD functionality. This you can use in MVC3, MVC4, MVC5. Some of my previous articles are as follows: MVC WebGrid Custom paging With Page no and Shorting Data Using C#.Net, MVC WebGrid Custom paging With Page no and Shorting Data Using C#.Net, Code to Dynamically Bind Image To Asp.net MVC WebGrid, Bind and Retrieve ListBox Selected Value in MVC Using C#.Net, Bind DropDownList Using Entity Framework in ASP.Net MVC Using C#. 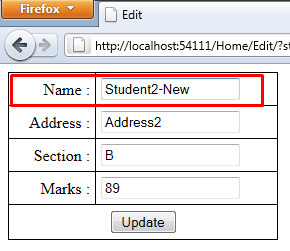 So for this article first we will create a new asp.net application in this we will add a model file in this model file add the below class code. 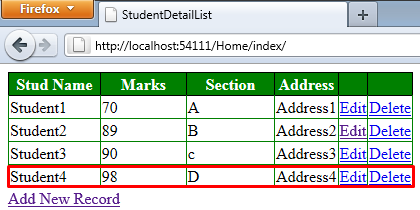 After creating model we will access entity table. Now in view add the below code. In this I have added link for edit and delete. So run the page to view the output. After this again come to you controller. Now we will write code to create a new record. So here is the code for HttpGet and HttpPost method as follows. Now we have completed with save operation. Now run the page to check the output. Now click on save button. 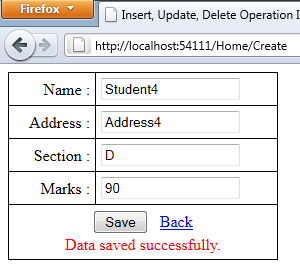 You will get the save success data message. Now Let’s code for delete record. In this we have used below mention code to delete the record. Now create the view and add the below code. 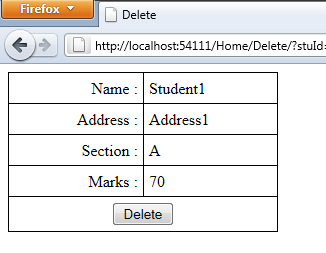 In above code first we have displayed the record and after that perform the delete operation as user click on delete button. Now run the page and check the output. After this click on delete button. After deleting your final output. Now let’s perform some update operation. In this first we will use the below code for edit. Now we generate the view and add the below cod in it. Now we have done. Just click on edit link post back will take place and it will display the record in textbox. Just change the record and click on update button. After successful update just check the output. Now we have done . Download the article and try by your self. 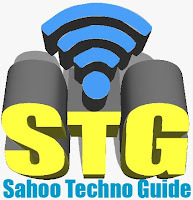 hi is it possible to upload file using webgrid.if yes please give me some idea about that are post example to related to that. Hi Ananth thanks for visiting aspdotnet-pools.com. i will try to provide you an example as per your requirement. Hi Ananth i have written and article as per you description. have a look of this article i hope this will help you. 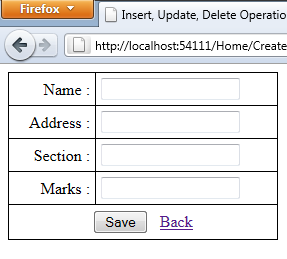 Please give me exapmle why we should use mvc.framwork rather than web forms..
Hi This is nice post I have learn so much from this post. Thanks for posting. I want to do CRUD operations for three tables and use only Four Views...?? Hi Meena the article is already there in which you have commented. Hey it's really good article.. as I am beginner, it helps me a lot to build a basic crud functionality. Thank you..
May i know Where is StudentManagerEntitie class. When you add an entity file in your project at that time you define the entity class file name. as i have used in it .StudentManagerEntitie. 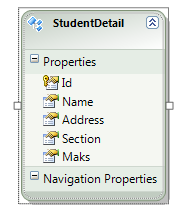 Here StudentManagerEntitie s the entity class file name. 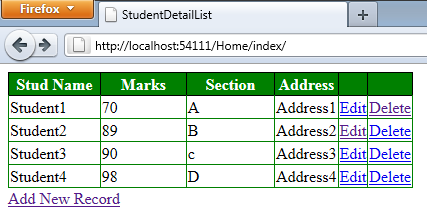 just wondering how to update student grid upon new record inserted, if both grid and create new record form are in same view..
Insert, Update, Delete Operation In Asp.Net MVC Using Dynamic CRM C#.Net ,CRUD Functionality pls send immidiatly.. It's already there. please check the above code. Good ...but you may tell me it is possible in entity framework...?? I have been written by using entity framework. Can you please tell what this class doing "StudentManagerEntitie "